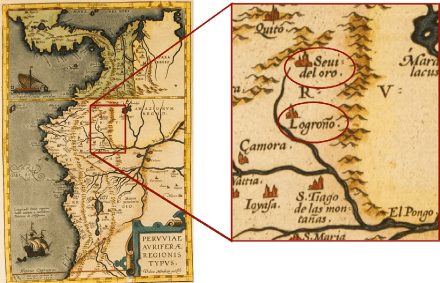 The Lost Cities – Cutucu Project is located in the southeastern part of the Republic of Ecuador, in the Province of Morona-Santiago. 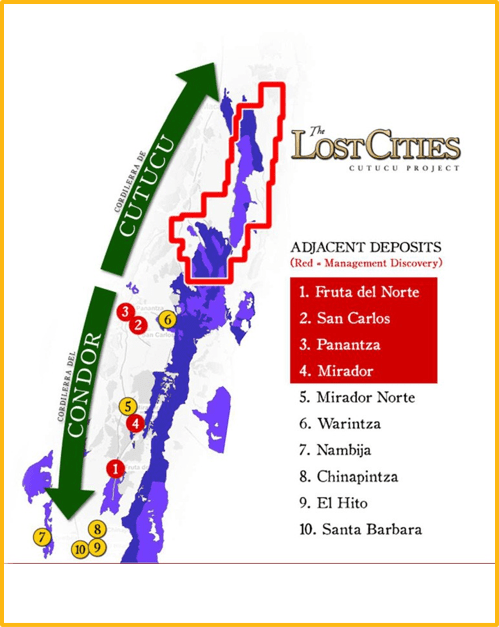 It consists of circa 208,000 hectares in 42 concessions occupying the central part of the Cordillera de Cutucu. The concessions extend approximately 95 km along the Cordillera. The 2,080km2 area has never been systematically explored with modern techniques. 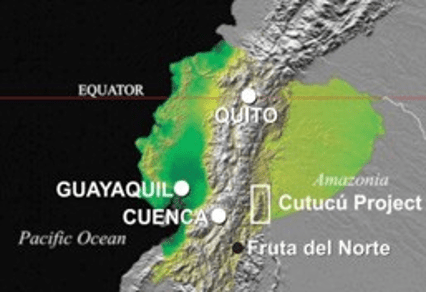 The Cutucu mountain range is the geological extension of the Cordillera del Condor that hosts ten major deposits (gold and/or copper) with recent announcements by various exploration companies highlighting the additional mineral potential of the geological trend. Detailed geological work aims to refine the details of the target in preparation for scout drilling. The “Crunchy Hill” target is being readied for scout drilling in Q4, 2018. Other targets will be readied for scout drilling sequentially after Crunchy Hill. The concept of scout drilling is an integral part of Aurania’s business model. Scout drilling – typically the drilling of approximately five bore holes of approximately 300 metres each. The crucial exploration data provided by the scout drilling will be used to rank the targets to determine which are in Aurania’s sweet-spot for advancement and which would be better advanced within a joint venture or potentially spun-out into another company.